3-Phase PAT Tester to measure the electric safety of single- and -phase electrical operating equipment. According to regulations are to test: resistance of protective conductor, insulation resistance, alternative leakage current, differential current, contact current, protection conductor current. The 3-Phase PAT Tester metratester 5-3P correlates with the regulations for workshop equipment of factories of electric installations issued by ZVEH, WFE, EVU etc. 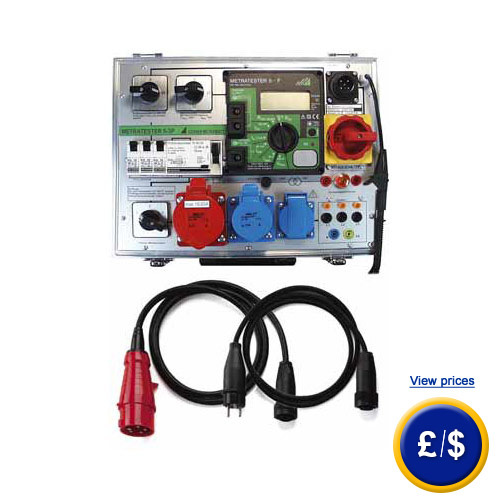 The 3-Phase PAT Tester can eligibly be operated via the two power supply connectors to an isolated ground receptacle or a 16 A CEE- mains socket. DIN VDE tests without mains operation: Protective conductor resistance, insulation resistance, alternative leakage current. DIN VDE inspections with mains operation at all single- and 3-phase devices: differential current, contact current. Efficacy checks with measurement of current input and voltage in the phases L1/L2/L3. The protective conductor is to be measured according to DIN VDE 0104 "right". Via a contact surface for finger contact the protective conductor potential is to be inspected. The signal lamp PE glows whenever between the touched contact surfaces and the protective contact of the electric supply socket, there is a potential difference of more than 100 V. The measurement of the differential current correlates with the guidelines about repeating tests DIN VDE 0702. All safety and operational tests are performed practically by overriding the supply voltage or the individual phases via switches onto the test objects. All measuring values are indicated clearly legible at a large digital display. Above all transgressions of thresholds are indicated optically as well as partially acoustic. The 3-Phase PAT Tester will be delivered in an inspection case with aluminium frame, whereas the demountable top can be locked. The corresponding connection adapter and the instruction manual can be stored there. Furthermore transgressions of thresholds are indicated optically as well as acoustically. Our technicians and engineers would be pleased to inform you concerning the PAT tester and all other products in terms of regulation and control, or scales and balances of PCE Instruments. - General requirements DIN VDE 0404: devices for safety-related inspections of electrical operating facilities. signalised due to display of "OL"
The brush sensor is applicable to connect touchable conductive parts, which rotate during operation, vibrate etc. e.g. 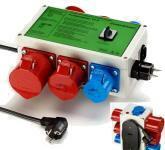 boring sockets, superfinish grinder, drilling bit inputs. for connection to grid without protective contact socket, consisting of coupling socket with 3 plumbed inputs, 3 adaptable crocodile clips and 2 adaptable inspection probes.